I won’t even attempt to give an overview of what happened at the latest BarCamp Ghana 09 which took place on Monday 21 December 2009 at MEST here in Accra. This year there seems to have been a lot more blogging immediately after the event, with a large number of tweets using the hashtag #bcghana09. I guess the best place to go is the BarCamp Ghana website, and specifically the recap pages. 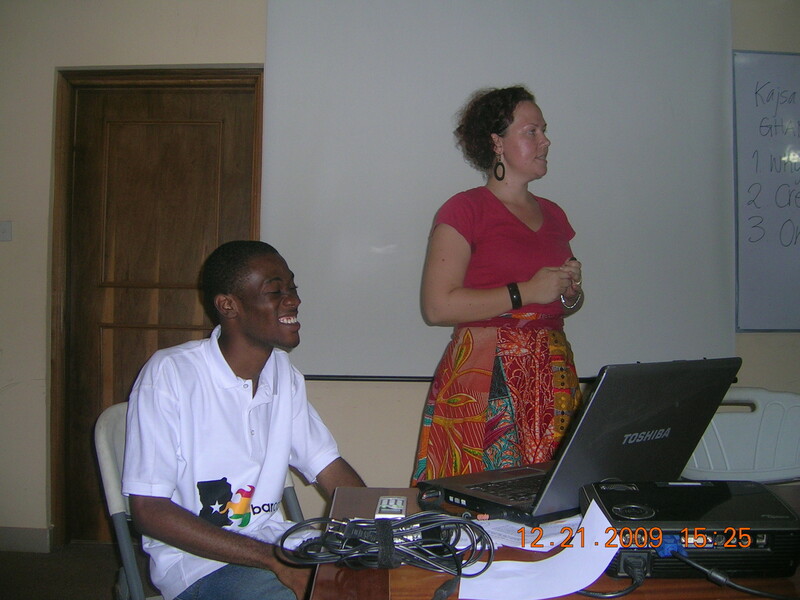 David Ajao put up some fairly comprehensive coverage via his website and blog, including one on Ghana Blogging facilitated by Kajsa Hallberg Adu. Chris Bennett also commented, though not so positively, in my view. But to get a real feel of what went on in the various break-out groups especially, the best place is Twitter. I admit I only went to two break-out sessions, as the day was getting quite long, and the prospect of traffic on the way home was not too pleasing, but when I got home I did actually go through several pages of tweets put by the BarCamp Ghana 09 team. There is also a Flickr stream of photos which is a good substitute for the usual photographer’s hard copy photos laid out haphazardly on a table! I will offer some very personal comments/reactions. Once again I was probably the oldest person there, but that didn’t really bother me, and I don’t know why I should even mention it, but maybe it is a feeling that there are a lot of people out there who probably feel that this kind of event is just not relevant to them. And maybe it isn’t, but personally I feel that many of them will have missed out on some really exciting developments going on. I continue to ask myself: am I the only librarian who is interested in this kind of initiative? Unlike some of the IT oriented colleagues who used their higher level mobile phones to find their way to the venue, yours truly did the “traditional” Ghanaian thing of asking someone – a driver at work – for directions. And basically that worked pretty well, though I didn’t realise the road on which MEST was located was untarred, but I did see a signboard, so was easily able to trace the venue, and very early I was too! I thought having some of the plenary sessions outside worked for the numbers that were present. It wasn’t too hot, but then I chose my seat carefully, to maximize the shade! The rooms for the breakout sessions varied – and seemed to be OK, though the air-conditioning didn’t seem to be overly cool, but maybe that was because of the numbers present? As usual, I left feeling that I could have networked a bit more, and maybe tried to stay longer. But altogether glad that I went. On Friday 20 November 2009 I spent the whole day out of the office, attending the 2009 Ghana Library Association (GLA) Seminar and Annual General Meeting (AGM). For some reason while I was at British Council I didn’t make a very concerted effort to attend these annual events, except when they took place at the BC. It is an omission which I do regret, as I think it is important to stay in touch with one’s professional colleagues. Every two years the GLA event and AGM takes place over two days, while on the alternative years, it is a one-day affair. 2009 was one of the latter years, so everything took place on one day, and as is not unusual here, there were a lot fewer people present at the afternoon event, as opposed to the official opening, and paper in the morning. As usual I got to the venue early, but there were some people there already – mostly members of the GLA executive – but it was good to have quite a while to sort out matters like stuffing papers into files, checking that the projector which the Goethe Institut had brought worked properly, and was in the best position for a presentation, and so on. Altogether attendance was fairly good – over a hundred, and people spent much of the pre-official time talking to friends and generally keeping in touch. It was quite a surprise that the Minister of Education, Alex Tettey-Enyo, was actually early, but as all the key people were around, there was the usual Ghanaian opening ceremony, with a prayer, introduction of key people, and then various speeches. TG none of them was too long. Interestingly enough the Minister of [or is it for?] Environment, Science and Technology, Sherry Aryeetey, also came in for a while. Not sure exactly why, though I was aware that she would be attending another conference in the same venue. But she too was pretty supportive of libraries. Tettey-Enyo did say that there was a need for new skills and competencies, and “that [it was] people not technology that create value for knowledge”. There were also speeches by the Director of the Goethe Institut (which sponsored the new GLA website) and of course by the current President of the GLA. I did wonder what people watching and listening thought about the new GLA website, as I didn’t see anyone come up after the initial opening ceremony to say “let me see… can I try?” Maybe people felt a little inhibited? The formal presentation was by Nii Tackie, a Lecturer at the Dept of Information Studies at the University of Ghana on “Life long learning: the role of libraries” which was the theme of the whole event. Personally I was a little frustrated at the manner of delivery as well as the content. Tackie did apologize for the lack of a PowerPoint presentation – due to “light off” at a crucial time the previous day – and said he would not read the whole of the fourteen page paper, which he didn’t. But to me, without a copy of the paper in front of me to read, it was somewhat frustrating. The content was very much a literature review in my opinion, and I would have thought it would have been more appropriate to tell the audience present to read the paper for this part, and then directly home in on the relevant bits – which were issues to do with the applicability of the seminar theme to Ghana and/or elsewhere in Africa. There were some questions, but not very many. The business sections of the AGM were fairly straightforward: President, Secretary and Treasurer’s reports, plus one from the Editor of the Ghana Library Journal . The only real controversy came up over whether or not the names of members should be published in the newspapers, and when this could take place. I was a little surprised at how passionate many people were about this issue, and realized upon reflection that this is often the practice for professional associations and groups in Ghana, and a way of giving a very public credibility to members. Overall I felt that the executive and organizers had obviously put a lot of work into making this event happen, but I did wonder how much the participants got out of it – professionally and intellectually.Does the format of having a very high table, and the rest on the lower level, promote interaction? Similarly the theatre style seating doesn’t really encourage a lot of people giving feedback. Would it be possible to have presentations to smaller groups – who could then report to the larger assembly, or something along these lines? Thoughts I admit, not really actions, but worth following up? I think I need to remember to take a photo of each of the books I read, mainly because I feel slightly odd about linking to a site such as Amazon all the time. After all how many of us in Ghana are buying our books from there? I do not come to you by chance, by Adaobi Tricia Nwaubani. The story of a young Nigerian graduate who is frustrated in finding a job, keeping his girlfriend, and living up to the standards that his family expect of him. So what does he end up doing? Joining the black sheep of the family, and becoming quite expert at 419s! I wasn’t sure what to expect, but it was both fun, and at times sad, and yet rang horribly true. The Jane Austen book club, by Karen Jay Fowler. I think it was the title that attracted me, already being a fan of Jane Austen. Did it live up to the promise? Not sure. For me it was OK, but not very exciting, or even particularly inspiring. A beautiful place to die, by Malla Nunn. Here the attraction was definitely the cover, and a niggling feeling that I had read a good review of this detective story set in the early 1950s in South Africa. It was quite atmospheric, with lots of tension, yet still the complexity of several of the characters did come through. I really liked it, and look forward to reading her future work. Wife of the gods, by Kwei Quartey. A detective story set in Ghana, with a Ghanaian detective! How could I resist? Since I first heard of it, it had been on a wish list, and I even went to the extent of talking to the author on his website – basically asking when there would be copies available here in Ghana. Didn’t get an overly satisfactory answer though. A fellow Accra Book Club member had bought a copy and lent me hers, so I quickly read it. Verdict: OK, in my view quite a few loose ends, or inconsistencies. Not bad on descriptions, but did it have atmosphere? Not really. But I’ll probably look out for his next work. Garlic and sapphires: the secret life of a critic in disguise, by Ruth Reichl. I am not a foodie – though I like eating, and sometimes cooking – but I enjoy reading cookbooks, and about cooking. The author writes very entertainingly about her “disguises” and visits to New York restaurants while she was a critic for the New York Times. Light reading, but I enjoyed it, especially as her relationship with her mother is recalled. Of course, I started some other books, which are still ongoing… And one of them has over 900 pages and even thought it is a paperback – is HEAVY!